Format: bilingual DVD, 45 min. I really wanted to enjoy Kai Doh Maru. The packaging and character design for this DVD seem to suggest a historical drama, not unlike the realistic Rurouni Kenshin OAVs. Unfortunately, despite a couple of interesting aspects, Kai Doh Maru is a disaster. Kai Doh Maru takes place in the Heian period (794-1192), an early period in Japan's cultural history, when the capital was based in Kyoto. The era is very different from other historical (ninja, samurai, and swordsmen) dramas, most of which take place slightly before, during, or after Oda Nobunga's unification of Japan, that we see brought over to the U.S. Kai Doh Maru follows a group of knights, led by General Raiko, who protects Kyoto. One of his troops, Kai Doh Maru, a girl raised as a boy, falls in love with him, which puts her into conflict with the jealous Princess Ouni. From the outset the most startling thing about Kai Doh Maru is its bleached look. The animators at Production IG wanted to give Kai Doh Maru a look similar to the art style of the Heian period, which means the entire animation has a soft look to it. Though many people who've seen the anime don't care for the look, I don't mind it. The soft colors are visually pleasing, but I think IG's idea to make it look Heian falls apart, since, obviously, the character design is classic realistic anime. Unfortunately, Production IG, which also created Jin-Roh and Blood: The Last Vampire, did not put the animation care into Kai Doh Maru that they did with those theatrical features. The animation is far from smooth and the characters seem stiff through most of the animation. The character designs, are ultra realistic - so much so that it's hard to tell one person from another, especially the female characters. In going for a realistic look, Kai Doh Maru forgoes the normal anime convention of using wild hairstyles and hair colors to tell characters apart (which is, in and of itself, not bad, as shown by the Kenshin OAVs), but can't create faces realistic enough to be told apart. However, Kai Doh Maru's biggest shortcoming is its plot. Perhaps Japanese viewers would be knowledgeable about the intrigues of the Heian court, but Kai Doh Maru doesn't give the viewer much help in figuring out the narrative. Kai Doh Maru occasionally hints at brilliance, but for the most part the film's plot is disjointed and events seem to happen almost randomly. Nor are the character's motivations ever adequately dealt with in the film itself. Even avant-garde films must support the fundamental tenets of storytelling to create an understandable narrative. Unfortunately, Kai Doh Maru doesn't really follow any logic that I can see. Perhaps the film was done when the director was out to lunch, but story-wise Kai Doh Maru doesn't hold up, especially when you consider that the basic love triangle plot is pretty simple and well used. Additionally, even though some Japanese (and I don't think it would even be all Japanese viewers) would have some familiarity with the basic plot of this film, that's no excuse not to bother animating aspects of it to create a balanced film. One can look at any number of Japanese historical dramas that Japanese viewers would know (like this month's feature, Musashi) that spell out a coherent plot. Frankly, I think Kai Doh Maru simply ran out of funds, as the length of the OAV, the spotty animation quality (which, at brief points, is excellent), and the mashed-together plot all seem to suggest high ideals followed by a lack of cash. Clocking in at about 45 minutes, Kai Doh Maru is much too short to tell a reasonable plot in the way it wants to. The Manga DVD release of Kai Doh Maru includes a number of extras, including character biographies (which become absolute necessities to figure out what is going on in the film itself), interviews with various members of the cast, a poster, and some Manga promotional club offer. Kai Doh Maru does have a few good aspects. The battle scenes, while not as good as the Kenshin OAVs, are somewhat interesting and watchable. The music too, seems very historical and adds to the Heian feel of the anime. However, to be at the level of Production IG's other releases, Kai Doh Maru needed much better action and about twice the running time. 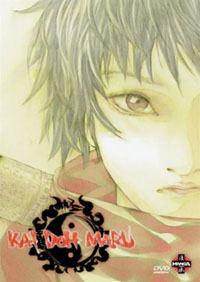 Sadly, if the plot were given more time to be fleshed out and the animation department a better budget, Kai Doh Maru could have been one of the new classics for this year and, like Jin Roh, could have been the darling of both avant-garde film fans and anime fans. Unfortunately, as it stands, Kai Doh Maru while visually soothing, does not stand up well as a film.